I have two finished projects to share today! Notes: I did one more repeat of the main cable portion then I typically do and I think it worked out well. Other than that, no changes! 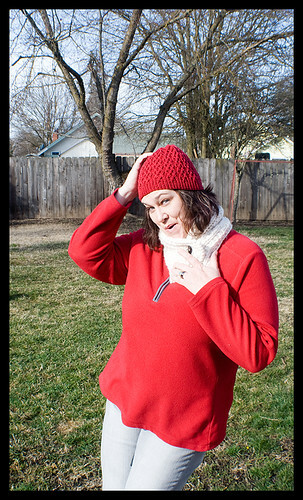 I really do love how this hat comes out and no matter how many times I’ve knit it (this would be the 4th if you’re counting), it’s still enjoyable. Notes: The only big change that I made is to make the thumb and fingers closed instead of open (full fingers/thumbs). On the second glove, I decided to pick up more stitches on the cast on edges of the fingers/thumb and then decrease them the very next round. This helped close up the gaps much better and if I ever do gloves again, I will do it this way. Doing it like that made for less holes I needed to close up when weaving in the ends. 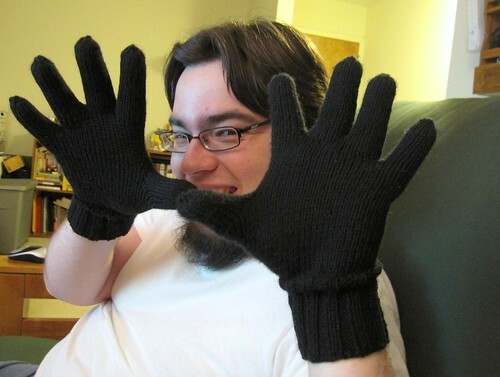 This was my first time making gloves. I have to say it was a bit fiddly to do all the fingers and thumbs, but wasn’t too bad (and went quickly!). There were a lot of ends to weave in! One thing I did learn in making these is how to weave in ends “properly.” I’m sure however I’ve been doing it works just as well, too, but I never really did know how to weave in ends “the right way” or the best way, so I did the “fake it til you make it” method up until this point. Being curious about it when face with so many ends to weave in, I Googled it and found this very helpful Knitty article. I guess I had just never really put that much thought into it before now. I think it looks a lot neater this way and I’m glad I bothered to look it up. Since I finished up the gloves last night, I cast on the pair of Lakeside socks I’ve promised to the same friend pictured above with the hat! Today, I was checking my Google Reader and saw a post by Grumperina showing a beautiful scarf. As soon as I saw it, I wanted to knit it. As I read more, I saw that this is a new pattern from her. The pattern is Mother of Pearl and it’s a free pattern from Crystal Palace Yarns. Very pretty! I have just the yarn for it already sitting in my stash. This morning, as I was leaving the house, I realized one of my mittens were missing. I searched around the kitchen table where I would have left it and couldn’t find it. Searched a few other places in the house and I still couldn’t find it. I didn’t think much of it, just figured I’d left it in the car, but when I got to the car, it wasn’t there either! I’ll look again when I get home tonight. I’m pretty sure I’ve somehow lost it between getting out of my car and going into the house last night. Thankfully I was already planning on making myself new mittens and have the yarn for them. I just wasn’t planning on having to make them so soon. I was more planning on making them by next winter, but I may need to move that date up if we keep getting snow like we have been! 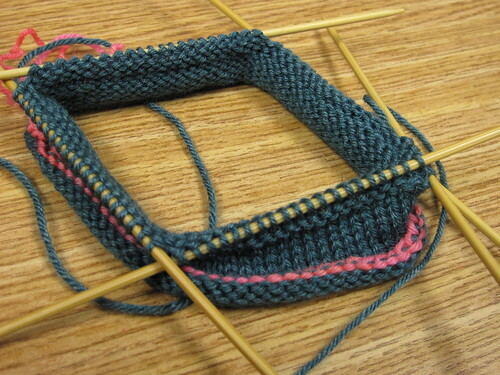 Next Post Lakeside Socks, Louet Spindle, and… a Babe wheel? Great job with the hat and the gloves! Gloves can be really intimidating!